Last year, I actually heard the term “Classroom Transformation” for the first time. I was at a Get Your Teach On Conference with other elementary school teachers. In my defense, I’ve always taught higher grade levels than I was teaching then. Hope and Wade King spoke about livening up the curriculum by transforming the classroom using a theme. Well I wasn’t confident this was something I could do, but I decided to take some baby steps and try it out. Since I was teaching 4th grade, and we needed to cover the importance of text structure, I decided we should perform Text Structure Surgery. I didn’t want to go all out like Hope and Wade, but decided to throw in some props and some sound effects. I read everything I could find about text structure and located a free download on Teachers Pay Teachers (https://www.teacherspayteachers.com/Product/Text-Feature-Surgery-for-Upper-Elementary-3582294) that I could adapt for my students’ needs. I was able to get medical gloves and masks from our school health clinic. I played a heart monitor visual/audio on my touchscreen. My students were grouped. Each group was given a couple of mixed up texts. They had to read the texts, paying special attention to all the text features. They were mixed up and out of order, so my little surgeons skillfully had to determine which parts were unnecessary and which ones needed to be rearranged. With scalpels (scissors) and sutures (glue), they arranged the texts and their features correctly. Most of all, they had a great time, stayed engaged, and will remember all about text features! This year, I moved back up to the high school level. I’m teaching English II, so over the summer I wondered what I could do to get my students interested in me and learning right from the start. Using some of the classroom transformation ideas, I decided that my sophomores might like to “investigate” me and the curriculum. I again checked out Teachers Pay Teachers and found a product (https://www.teacherspayteachers.com/Product/First-Day-of-School-Investigate-the-Teacher-Activity-3297979) that I could purchase and adapt for my needs. I again wanted a few props. I played the theme song from Law and Order on my interactive board this time. As students entered the room, they saw a “chalk outline” on the floor and an area that was taped off as a “crime scene.” Each student received an investigative file on the case. I purposely planted clues around the room, such as a photograph of my family, charts on bulletin boards, and more. Each student had to observe and record four pieces of evidence before grouping for discussions. They had to use their evidence to make inferences about their suspect (me) and the crime (English II). While they were working, I could observe the students working collaboratively to determine their skill levels. It was interesting to read their thoughts about me and their reflections on the assignment! If you like mixing things up a bit….even if you teach older students… check out Hope and Wade (https://www.setthestagetoengage.com/meet-the-kings.html). They are dynamic speakers, authors, and educators at The Ron Clark Academy in Atlanta, Georgia. For the last couple of years, as our cocker spaniel aged, my husband and I decided to embark on a new “pet project.” We knew we didn’t have much time left with our beloved Sasha, so we discussed and researched different breeds of dogs. We considered my son’s and husband’s disabilities. We determined that the popular cross between golden retriever and poodle, known as a goldendoodle or groodle, would be a perfect fit. At first, my husband liked this designer breed on paper, but he thought he wanted a more manly dog, and these just seemed to fluffy and girly for him. We attended a family event at my daughter’s university and saw a young man playing fetch with a gorgeous, agile dog. My husband said, “See, that’s what I want.” He decided to talk to the Frisbee-thrower himself and was informed that this was a goldendoodle with a short haircut. That’s all it took for my husband to realize these beautiful mutts could be cute and fluffy, while still being manly and sporty. A couple of years later, we now own two standard sized goldendoodles, a miniature goldendoodle, and a standard poodle. Since he is home during the day, it is primarily my husband’s job to take care of our pooches, grooming and training them. We recently bred our two first doodles to produce a litter of puppies. We’ve researched genetic testing, gestation in dogs, and marketing. What a learning experience this has all been! While he has been in charge of the physical care of our dogs, I’ve been in charge of the social media and marketing aspect. Of course, I’ve had my personal social media accounts for years, but really trying to develop a presence for my pups has been quite an undertaking! I’ve learned more about Instagram than I ever thought I needed to know and learned to build a Wix website. They’ve even become Influencers (a term meaning that sponsors send us free/reduced pet-related items in exchange for us posting pictures and reviews)! This time with our Tiger, Sugar, Bijoux, and Dixie has been busy, rewarding, and educational. If you would like to learn more about them, feel free to check out their website (www.bbbgoldendoodles.com). To keep up with their shenanigans, please follow them on Instagram (www.instagram.com/bensbestbuddy). I would love more feedback on both sites… because I’m still learning! Technology is second nature to my students, and they use social media to make their first impressions. Why not adapt some of the apps they are already using, to help them get engaged with the reading, writing, and publishing process? That’s where #booksnaps come in. 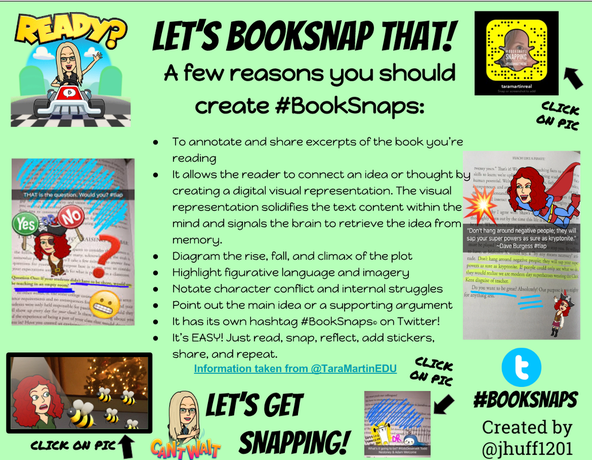 Jennifer Huff designed this fun graphic (https://twitter.com/Jhuff1201/status/820823270031294464) to visually show several benefits for teachers who use #BookSnaps in the ELA classroom. This is something that I know my students will enjoy. Using the COVA approach (Harapnuik, Thibodeaux, & Cummings, 2018) to instruction, this is another way our students can demonstrate their learning while still giving a choice, ownership, and voice to our learners. Using the technology to publish an artifact they will be proud to share will provide them with an authentic learning experience. How should we get started? *Choose the toolbox “markup” – your tools will show at the bottom. *Take a picture of the book page. Still not convinced? Not sure exactly how this will look in your classroom? Check out this video from Tara Martin ( http://www.tarammartin.com/resources/booksnaps-how-to-videos/ ). She has included several examples using different platforms on her website. Check them out, and your get ready for student engagement! Harapnuik, D., Thibodeaux, T., & Cummings, C. (2018, January). COVA: Choice, Ownership, and Voice through Authentic Learning [PDF]. Creative Commons License.